You've almost made it to Christmas break but you still have a few days to go and you want to have a little fun with your kid's school lunch. I have you covered! 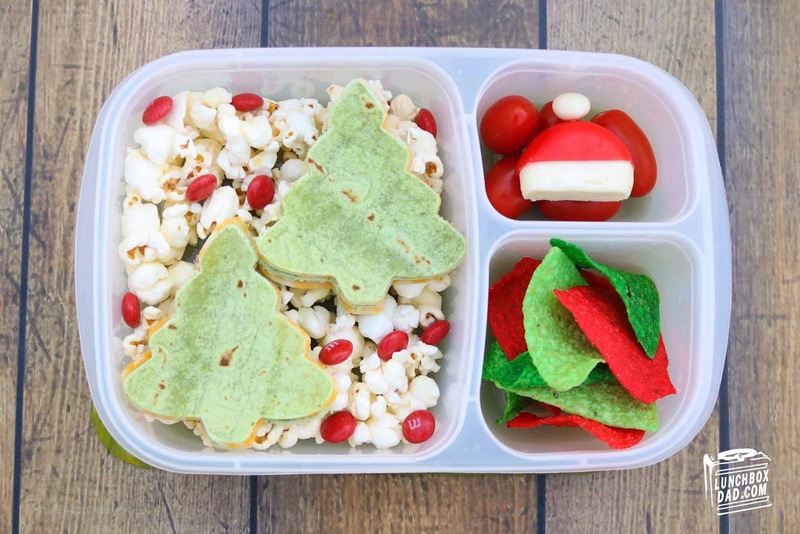 Here is a simple school lunch that brings in the holiday cheer. My kids devoured this one and I even made it for a local TV show! It really only takes a couple of minutes to assemble once you have the ingredients on hand. So get to work and have a Merry Christmas! 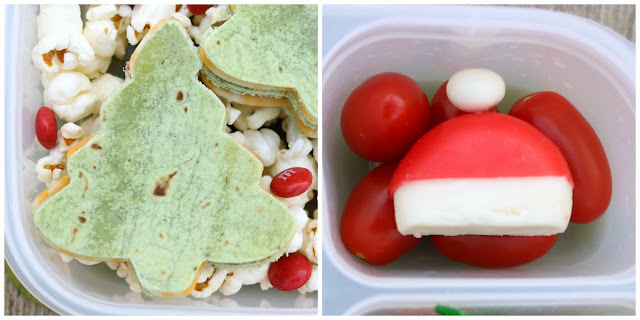 Ingredients: Spinach wrap tortilla, cheese, salami, popcorn, red candy, red and green tortilla chips (or another Christmas themed cracker, etc. ), grape tomatoes, Babybel cheese, yogurt covered raisin. 1. Use a cookie cutter to make the tortilla, cheese, and meat into a tree shape. Assemble into a sandwich. Repeat with second tree. Drop popcorn and red candy into main compartment as a background and put tree sandwiches on top. 2. In side compartment place grape tomatoes. Cut half of the red wax of a Babybel cheese round and also cut off the bottom part of the cheese. Use a toothpick to attach a yogurt covered raisin to the top and place on the grape tomatoes. 3. Arrange red and green chips in second side compartment.